Score 45000 points to complete the level. This level board is again same to normal candy crush saga and have 9 chocolates, grill boxes and four meringue blocks are in bottom. This level wont be that hard as you have 30 moves and to complete this level you should try to break all blockers by using special candies or try to increase moon power by breaking candies that are in corner of both side of moon. As moon will struck it will break same color candies and give more chance to make special candies. You shouldn’t forget to balance the Odus owl and try to combine special candies to each other to complete level within all moves. 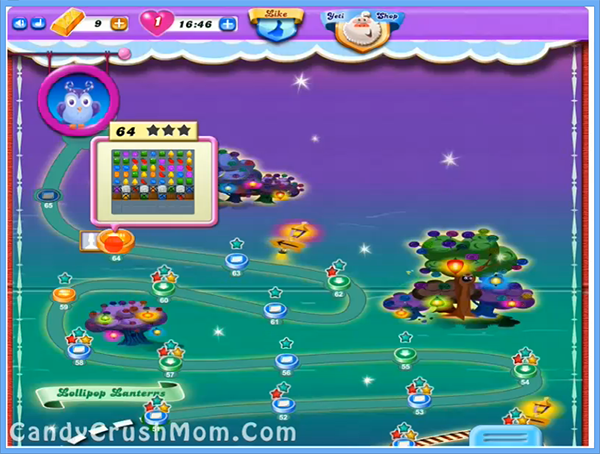 We completed this level with 152200 score and got two colorbomb that help to make three star points on score board.